There has been a Cinnamon Teal at MINWR for the past few days now, and no one really knows what it’s doing here. Cinnamon Teal are normally found in the western part of the U.S., and this time of year they should be wintering in Mexico, Central and South America. According to the Merritt Island bird list, the last time a Cinnamon Teal was seen here on the refuge was in 2000. 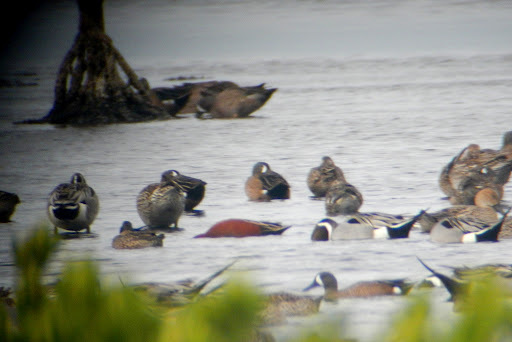 The Cinnamon Teal is the one in the middle, with its head underwater. So I decided to take a video instead, because then I wouldn’t have to worry about my timing. 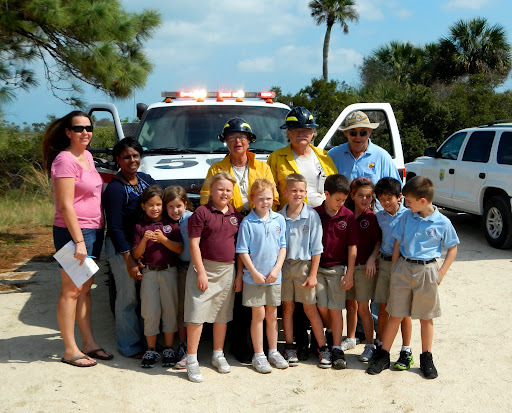 That, and we had to go pick up a fire truck for a school program later that morning, so we didn’t have much time to mess with taking pictures. The Cinnamon Teal is the reddish-cinnamon colored bird in the middle that keeps putting its head underwater. There are quite a few Northern Pintail swimming about in front of it, and a couple Blue-winged Teal snoozing behind it. The black on the side is because I took the video through the spotting scope with my little point-and-shoot, and I’m still learning the ins and out of digiscoping (taking pictures with a camera through a spotting scope, i.e. using it as a big lens to get pictures of far away birds that otherwise would be little specs). I also took pictures of the fire truck, and I got to ride in it. It smelled like smoke, and was basically just riding in a big white truck with lots of extra buttons I wasn’t allowed to touch. 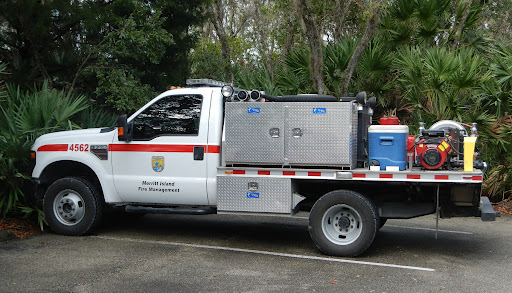 USFWS fire trucks don’t have sirens, because they don’t exactly need them to fight forest fires and manage controlled burns. The animals already know to get out of the way, they don’t need a siren to tell them something’s burning. They’re smart like that. 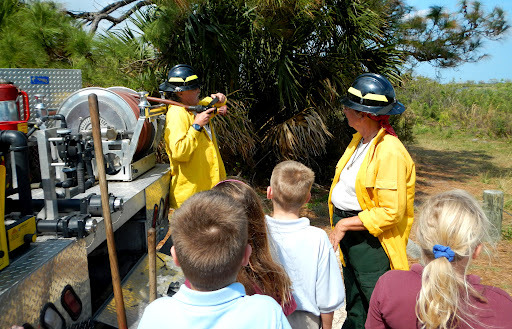 The kids loved the program, and hopefully they learned a little bit about controlled burns as well as all the animals that depend on scrub habitat. No wonder you couldn't get a good pic of that cinnamon teal! He is very cute though.